Well, as you can see we are equal parts Korean and American, that is United Statesian, for lack of a clearer word in English. Perhaps the Spanish word, Estadounidense would serve us better. At any rate, I'm Andrew and my wife is Olivia and we're on an adventure called life--it's pretty much amazing. 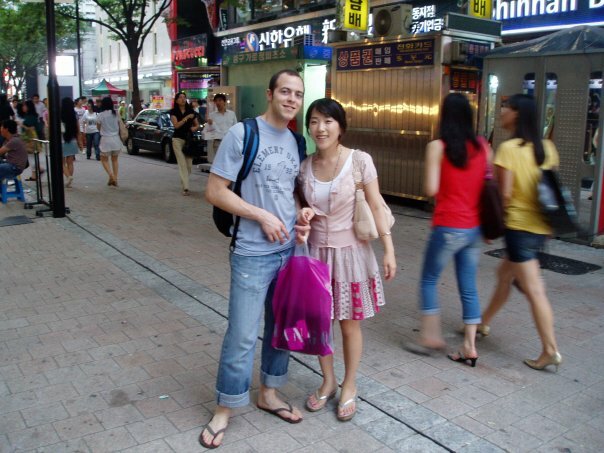 We met in Korea while working together at an English school and managed to survive her mother's unrelenting 'Don't marry that American boy!' and 'Tell him to go marry an American girl...' and some other things that might make you cry, all so we could 'live happily ever after'. We are intrepid and will not take 'no' for an answer, oh no we won't. This is why we're happy now. I lived in Viña del Mar, Chile and studied in Valparaíso before I finished college and later found myself teaching English in Korea--of course SOUTH Korea. Olivia, well, she was raised by gods and fed grapes by hands of multitudinous servants until she came of age, which is when she quit her job at a very professional organization and came to the land of the free to study. After she returned to Korea, providence had some sweet plans for us so we brushed off all the haters and decided we were made for each other by God. We're in progress now, I guess we could say--waiting for the new job and life to start. The Navy was our path of choice but my eyes have proven to be less than satisfactory, so we're currently improvising. That's right, our life plans aren't working out. Imagine that. How is it marrying a sweet Korean girl? Well, I'll try to tell you some interesting stories and share the parts that are sweet like organic honey, and I hope you find it worth your while. We are normal people with a crazy side so don't think we're too much different from you...after all, we all have some crazy in us, it just has to find its way out :) Please read and enjoy and I hope it enriches your life like a bowl of hearty oats with a side of fruit for regularity. Oh yeah, and thanks for stopping by. 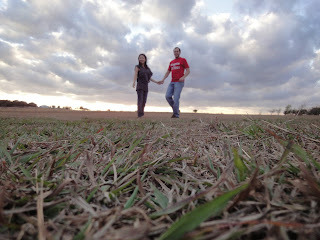 Here we are, taking trendy photos in a random Texan field. Only in Texas are things so big. This is us in Myeongdong, Seoul, South Korea.